Hughlette "TEX" Wheeler (1901 - 1954) was born in Florida. 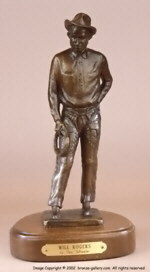 He worked as a ranch hand as a young man but had a talent for sculpture. He won a scholarship to study sculpture in Paris and while there he produced a number of Western sculptures that were cast by the Valsuani foundry in Paris. He returned to the United States and opened a studio in Cleveland, Ohio. He moved west to Arizona for a while and then went on to Los Angeles where he had a studio before returning to his native Florida where he died. All of his works are of a Western theme with most being cowboys at work busting broncos, riding the range or even miners with pack horses. He did several portrait commissions of patron's horses and even polo players and their horses as well as portraits of famous race horses. His works were cast by Roman Bronze Works New York, Gorham Co. Foundries NY, Valsuani foundry in Paris, Antioch Art Foundry, Antioch College Ohio, California Art Bronze, and Nelli Art Bronze both of California.